Professional development workshops are an integral part of every teacher’s growth and inspiration. Wisconsin Music Educators Association (WMEA) strives to offer a variety of meaningful opportunities for members through CMP workshops and in collaboration with Wisconsin School Music Association (WSMA) for summer and winter workshops. We are excited to announce WSMA Professional Learning Workshops are being scheduled for Summer 2019! We hope you will join us in Green Bay on July 21-23, 2019 as WMEA master teachers and presenters lead deeper exploration of the WMEA State Music Standards! This workshop will provide an opportunity for participants to see how master teachers design curriculum and instruction in band, choir, orchestra, and K-12 general music. Click here to learn more about this and other exciting workshops! 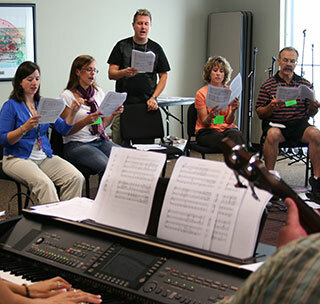 Each year WSMA hosts a variety of professional development classes and workshops for music teachers at the Wisconsin Center for Music Education. Classes run from one to five days depending on the course, and many include an option to earn graduate credits. Created and taught by real teachers, this is the authentic professional development experience that will really transform your work. Come experience the energy and excitement of creative, passionate K-12 music teachers, new and veteran, instrumental, general and vocal all in one place! A natural fit for PDP and other professional goals. Current educational initiatives are examined from a CMP perspective. A perfect mix of inspiring and practical! Offered each summer for one week in late June or early July. Visit the CMP Summer Workshop webpage for more details!